The tour can begin from Guatemala City or Antigua depending where you are staying. It begins with a visit to the Hotel Zone heading towards the city center. On arrival, visit the Palacio Nacional (panoramic), “Catedral Metropolitana, Centro Civico and the residential area. In the afternoon visit the “Archaeology & Etnology” museum, that shows the development of the Mayan culture. 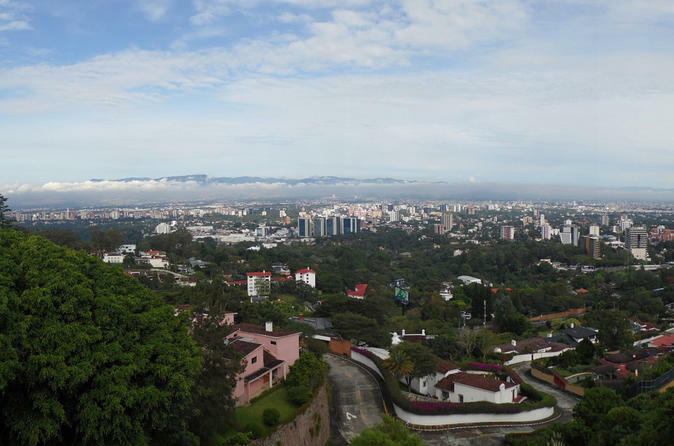 8:00am: Departure from your hotel to the center of Guatemala City, located in a mountain valley called "Valle de la Ermita" in the south central part of the country. On the way you will have a view of the residential zone such as Zone 14, Avenida Las Americas and Avenida Reforma. You will have a panoramic view of the National Palace (Palacio Nacional), “Metropolitan Cathedral” and “Civic Center” which consists of buildings built between the 50s and 60s such as Supreme Court, the City Hall, the Guatemalan Social Security Institute, the Guatemalan Institute of Tourism, the Ministry of Finance and the Bank of Guatemala. Enjoy of the Relief Map of Guatemala, a jewel of engineering and art which is an overview of the country erected at ground level. It was built in 18 months from April 1904 to October 1905, with materials of brick, mortar and a coating of Portland cement. Its author describes it as: "It is, in its genre, one of the most remarkable engineering works that exist in the world". Visit to the central market where you can see variety of handicrafts produced in the country such as ceramics, textiles, leather, wood, silver, tin, as well as fruits, vegetables and typical food. 1:00pm: Time to have lunch on your own. 2:30pm: Your guide will take you to the “Archaeology & Ethnology” museum that houses a collection of about 20,000 archaeological artifacts and ethnological 5,000 pieces. 4:00pm: Transfer back to your hotel in Guatemala City or Antigua.